Add pitch randomization with sample and hold (a lot of it). Hold that key trigger so you can use your fingers for something else. (Here, the Voyager’s X/Y pad. Route mod wheel to LFO. Route LFO to pitch, add more triggering, timbral modification like FM …and go all wobbly. I’m not sure there are quite ten tips in there, but you’ll see how to dazzle fans and frighten small children and pets. Come to think of it… okay, maybe I do know how he wound up in the pantry. But with gentle acoustics and plenty of snacks, it’s not a terrible idea. I’m counting that as a tip. 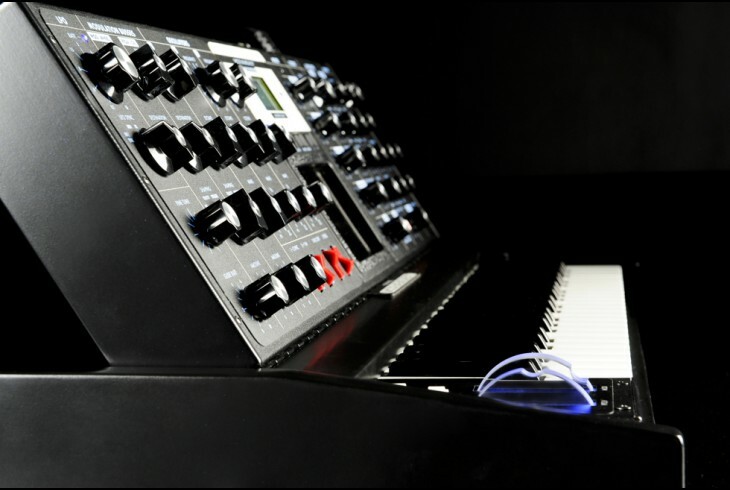 Using Moog Voyager to process audio track with additional sounds. plays like a turntable. Excerpt from the Moog Voyager Training DVD used by permission of Moog Music Inc.
Minimoog Voyager. Photo courtesy Moog Music.